The DEWALT DXGN4500 is designed with the professional contractor or rental operator in mind. This unit is powered by a 270cc Honda GX270 manual start OHV engine with auto shut off for low oil. The premium alternator provides low harmonic distortion. The large 7 Gal. tank with fuel gauge runs up to 15 hours at 50% load. Features include a hydraulic/magnetic circuit breaker that provides overload protection, a digital hour meter for monitoring run time and tracking maintenance and an idle control to reduce noise and save fuel. The steel frame is job site tested and includes a lifting hook. An optional wheel kit in available. 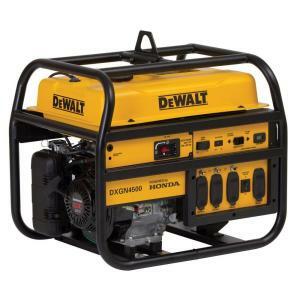 Tbook.com crawls the web to find the best prices and availability on Generators and related Tools and Hardware products like Dewalt 4,500-Watt Gasoline Powered Manual Start Portable Generator with Honda Engine. For this page, related items include products we find that match the following keywords: "Generator GENERATOR" at our vendor partner Home Depot. Dewalt 4,500-Watt Gasoline Powered Manual Start Portable Generator with Honda Engine is one of 152 Generators and related products listed in the Tools and Hardware section of Tbook.com If you have any questions on this product, please give us a call at 734-971-1210 during the hours of 9am - 5pm EST for assistance. Thank you for shopping at Tbook.com, the Internet Department Store!